Businesses and property owners rarely begin projects with plans to fail. The fact is however that many projects do fail and many owners end up confused, looking around trying to figure out what happened and why. While there are many reasons for such failures most of these can be traced to a single problem: A lack of understanding of the contracts and contract drafting required to lock-in success. Unfortunately this problem occurs not only with owners and contractors but with most Project Managers as well and this lack of understanding can lead to disastrous consequences. • The client took a ready-fire-aim approach. That is, the contract, and particularly the scope, was settled upon before an expert could make dramatic cost saving and risk prevention contributions. 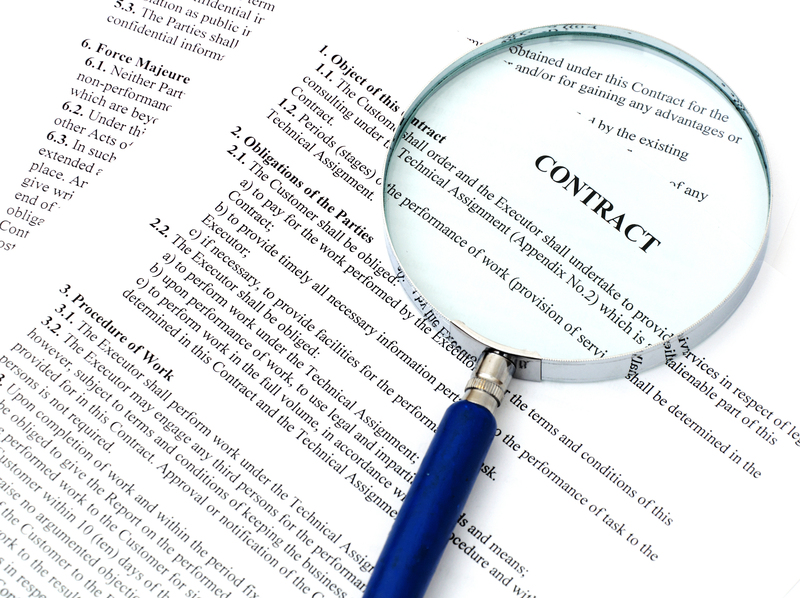 A well crafted contract is, and should be, a very versatile tool. The details of the contract not should not only protect the legal interests of stakeholders but also contain expectations of performance of the service and/or the quality of the finished product. Without proper protections, the agreement might as well be written on the back of a napkin. Strong contracts the necessary scope and protections for the project’s and client’s success. Doing this right can mean hundreds of thousands of dollars; saved or lost. When a project begins, especially before the contracting phase, successful users, client and tenants should expect their project lead to protect them from what they-don’t-know-they- don’t know. Most users of real property are in a field or industry for which architectural and engineering administration is not a required or institutionalized skill set. It is especially important to have a professional PM review contracts before signing to ascertain that owners are properly protected. A good example of this is when there are unexpected and unpreventable delays in one or more phases of the project. Delays lead to costly change orders and, in the end, the user typically will have to shoulder the loss. Consider excerpts from this example. The plaintiff commenced an action to recover damages for delays in the construction of a college library, which involved the renovation of two existing buildings and construction of an addition. The defendant…as agent for the owner, entered into a contract with the general contractor, whereby the general contractor agreed to act as construction manager, “[e]xpedite and coordinate the work of all Contractors,” and prepare a schedule for the project. Pursuant to the “General Requirements” of the contract, the owner’s agent, was required to provide a “Critical Path Method” (hereinafter CPM) schedule, but plaintiff was obligated to cooperate with the contractor in the development, implementation, and updating of the CPM schedule. The “General Conditions” section contained a no-damages-for-delay clause which stated: “No claims for increased costs, charges, expenses or damages of any kind shall be made by the Contractor against the Owner for any delays or hindrances from any cause whatsoever; provided that the Owner, in the Owner’s discretion, may compensate the Contractor for any said delays by extending the time for completion of the Work as specified in the Contract.” Further, “Should the Contractor sustain any damage through any act or omission of any other contractor having a contract with the Owner or through any act or omission of any Subcontractor of said other contractor, the Contractor shall have no claim against the Owner for said damage.” Provisions were made in the contract for changes and extra work. Delays in the project were attributed to a number of causes. The primary witness at the trial acknowledged that the schedule was updated four or five times but, in his opinion, the schedule was useless. He also acknowledged that there were weekly meetings of the prime contractors, the architect, and other representatives. Updating the CPM schedule was abandoned in favor of two-week schedules, referred to as “look-a-heads,” because the updates were always behind what was actually happening as a result of deadlines not being met. Among other things, the court held that the no-damages-for-delay clause exonerates the defendant for delays caused by inept administration or poor planning [poor project management]. A well crafted project contract should cover all aspects of the contract, including fine details like micro schedules for individual subcontractors, and most importantly outline expectations of each entity and the firms under their direct supervision. A well drafted contract gives the PM powerful tool to keep the project running smoothly. Each of the terms of the contract, down to the smallest detail, can (and should) be expertly negotiated. An expert project leader should be expected to bring a broad set of skills to the effort and be able to foresee possible future problems and plan for them before they happen. The problem is that so few project management practitioners have the necessary credentials to carry this off and many in the community have basically decided that this type of involvement is simply not part of the job of a PM. They fail to recognize the very real fact that critical aspects of the project, such as contract details, are left out of the general structure it undermines the likelihood of meeting time and budget targets. An expert project manager should have considerable design, engineering and construction experience to successfully complete the project. They should also possess sufficient contract drafting experience to handle and anticipate problems. Otherwise, without this potent combination of talents, users, tenants, purchasers and other occupiers and improvers of real property are just doing what they have always done, with the same unfortunate results.